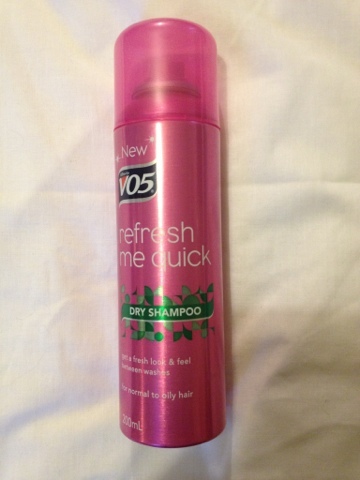 I picked this VO5 Refresh Me Quick Dry Shampoo on a bit of a whim to be honest, I'm pretty loyal to Batiste Dry Shampoo's these days after going through some horrors of dry shampoo's (I didn't like the Timotei Pure dry shampoo at all - review here). Having said that, I really liked this one, it smells amazing, it's got a sweet scent but is really fruity and fresh as well, it's definitely got a clean and refreshing smell to it and it just really nicely refreshes my hair in between washes and gives it a bit of volume (but not too much, some can leave you looking like you've just stepped fresh out of the 80's). It doesn't leave a residue either, I find sometimes that your hair can get that real powdery feel to it after using dry shampoo which can sometimes leave it feeling worse than before but this leaves virtually no residue. Plus, it comes in bright pink metallic packaging, what's not to love? I would have re-purchased this but I went to Boots the other day and couldn't find it so I did re-purchase my Batiste but I would definitely pick this one up next time. Price wise, they're fairly similar, Batiste is about £2.99 and the V05 is about £3.69 and for me, V05 just wins because of the smell! Which is your favourite dry shampoo?